In this article, we explain the importance of the Q-angle for women and how it affects stability, power and susceptibility to injury. In layman’s terms, the Q-angle is that formed between the upper and lower leg and directly affects the alignment, stability and functionality of the knee joint. The higher the Q-angle the greater the chances of the kneecap not travelling over the front of the knee joint as it should. Over time this can damage the cartilage on the rear of the kneecap, so it is not something that should be ignored, particularly by women because, owing to their naturally wider pelvis, in percentage terms, women usually have a 20-25% larger Q-angle than men [17-18° compared to 13-14°]. 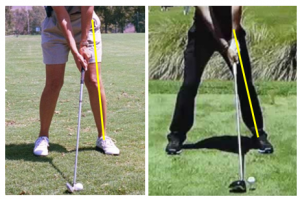 This difference in alignment of the lower extremity between the female golfer on the left and the male on the right is clearly visible at address. In practical terms it not only reduces stability and power, but increases the risk of sustaining niggling injuries, so all female golfers should work on reducing their Q-angle. Conditioning exercises should be performed which focus on restoring optimal balance to the involved musculature: improving flexibility of the typically tight muscles and strengthening the weaker ones. It should prove particularly beneficial to strengthen the gluteal muscles and the vastus medialis. Weakness in the glutes and external rotators of the hip (often in conjunction with overactive hip adductors) prevents proper stabilization of the thigh bone. There is a tendency for the hips to move into adduction and internal rotation and the knees to be pulled inward into a collapsed ‘knock-kneed’ posture with the feet also rolling inward flattening the main arch on the inside of the foot. The problem is compounded if there is also inadequate range of motion at the ankle and tight calf muscles. 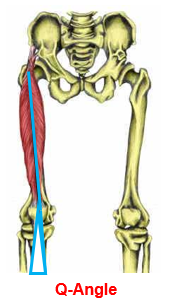 It inhibits the forward movement of the shin and knee. The foot then rolls inwards to compensate. This forces the shin to internally rotate, causing internal rotation and adduction at the hips, thus pulling the knees into that knock-kneed posture we just mentioned. It is important, before moving on to working the knee itself, to eliminate excessive pronation at the feet with exercises to strengthen the ankles and to re-build the arches in the case of flat feet. It is also extremely important to achieve a centrated hip position and to be able to hinge at the hip corrrectly. However, since a correctly aligned hip joint relies upon a neutral and adequately stable pelvis that is where work needs to start. Only when you have sorted out any alignment issues in your ankles, pelvis and hips should you focus attention on strengthening and stabilizing the knee itself.Clearly, it is important to build on firm foundations, so you must be patient and willing to start small. A good first step would be to sit on the floor with a rolled towel or cushion under your working knee, so that it is slightly flexed and press the knee down into the towel so that it straightens and your heel lifts clear of the floor. You will be able to see your quadriceps muscle contract. Work on strengthening (shortening) the muscles on the outer leg with exercises like the clam and banded crab walks and only introduce squats and lunges once the muscles around the knee have been balanced and strengthened and joint centration and stability has improved. Use a mirror to check that you have developed sufficient strength to maintain alignment of the knee above the ankle and that your knee does not ‘collapse’ inward at all. As always, good form is paramount, so start with quarter or half squats against a wall or exercise ball. Again, only once you can sustain good form for 16 reps should you think about increasing the level of challenge with exrcises like single-leg quarter squats with banded abduction. If you would like us to produce a conditioning module that specifically focuses on improving the Q-angle, please use the Contact Form to register your interest.